Mexican food doesn't have to be a nutritional disaster! In fact, the building blocks for most Mexican dishes are perfectly healthful. And with a few easy modifications, Mexican recipes can be a great part of a wholesome diet. Recently I’ve had a couple people ask if there’s a way to make Mexican food healthy. Of course there is. To the extent we think of Mexican food as unhealthy, it is generally the Americanized version that is a problem, not the cuisine in its simplest form. In fact, as a general rule, most cuisines in their original form are perfectly healthful, relying as they do on real, fresh, seasonal foods and quantities moderated by natural food supply constraints. 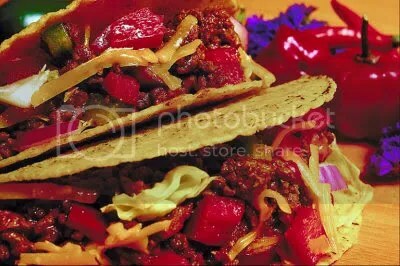 Think about the foundations of Mexican food:* beans, corn, beef, chicken, cheese, lettuce, tomatoes, peppers, and so on. There is nothing wrong with these foods in and of themselves. Problems only arise when they are not used in balance, with variety, in their real form, and in decent portion sizes, e.g., nachos drowned in melted cheese product, burritos made from white flour tortillas that are big enough to feed three, refried beans made with lard and smothered in cheese, vegetables limited to a dab of shredded lettuce and a couple pale tomato slices. Pump Up the Vegetable Color Standard Mexican fare can be pretty beige, for no good reason. There are a lot of vegetables that pair well with Mexican flavors. Familiar partners are spinach, avocado, zucchini, yellow squash, tomatoes, onion and sweet bell peppers (green, red, yellow, etc.). But it’s also ok to fusion in some new color, like eggplant, asparagus, winter squash, chard, broccoli, carrots and green beans. Sub Green for White Speaking of vegetable color, don’t even bother topping tacos and burritos with all-but-white iceberg. Instead, pile on verdant green and red leaf, Romaine or Bibb lettuce and reap the nutritional benefits. Add Sparkling Sides There’s no rule that says Mexican food can’t be accompanied by vegetable sides. Crunchy raw vegetables go especially well with the soft textures of many Mexican foods–and can help moderate how much of the heavier fare we eat. Use Whole Rather Than Half Grains White rice and white flour and refined corn tortillas are a bad deals, providing the starchy calorie half of a grain, but only a miserly few of its astounding array of vitamins and minerals. It takes nothing to substitute whole grain tortillas and brown rice–and the folks at your table will barely notice! Meats Simple. Use leaner types of protein ( e.g., chicken, fish, low-fat tofu) or drain excess grease from cooked meat before incorporating into your dish. Also, consider pasture-raised meats for a leaner, and usually more sustainably grown option. Non-Meat Options Beans are a natural fit for Mexican food, but not just the refried variety. Whole beans–white, red, aduki, lentils and black–are highly nutritious and tasty, low fat additions. Substitute them entirely for meat and see how easy it is to have a Meatless Monday for the environment. P.S. Low fat beans are a perfectly fine substitute for the full-fat variety. Cheese “Lighten up” is the word here. Mexican flavors are delicious–but you’ll never experience them when a dish is swimming in melted cheese. Gradually begin to reduce the cheese load in your dishes and your taste buds will be grateful for the opportunity to really taste the Mexican flavor palette. Grate cheese on the fine holes of your box grater to make smaller amount spread further. Sauces Most salsas are pretty decent, but watch out for added sugars (no need for them) and excess salt. Other prepared sauces (e.g. enchilada, taco seasoning mixes, green chili) often require more caution as they are frequently carriers for artificial colorings, preservatives and flavorings. Think there’s no way you could like Mexican food healthy style? I would have had the same concern when I first started eating for wellness. so I can say with assurance: Don’t worry, your taste buds will adapt if changes are made gradually. You might well discover, as I did, that you prefer the truer taste and lighter feeling that comes from eating Mexican food unburdened by all its Americanized traits. Want to learn more about making your favorite foods in a healthy way? Join Mary Collette in one of her many Whole Kitchen Meal Making Classes. * This refers to that narrow category of the cuisine that we Americans call “Mexican food;” the cuisine is actually far more diverse.